Bestar Pur by Bestar 84" Full Wall bed kit in Bark Gray - Combining style and convenience, Pur by Bestar is the perfect solution to furnished condos, lofts, studios, guest's rooms and home offices. The collection brings multi functionality to a single room. 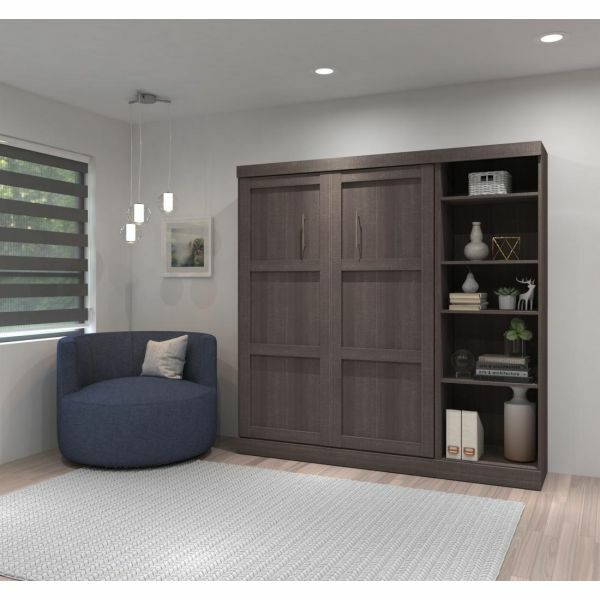 The kit comprises a full size wall bed and a 25" storage unit. The mechanism provides simplified assembly of the Wall Bed. Increased comfort due to Euroslat mattress support system. Simple and safe dual piston system makes opening and closing user-friendly. Easy to use; use the handle to pull the bed towards you to lower the bed and flip the leg down onto the floor. Accommodates a standard full mattress up to 10" thick and weighing at least 70 lbs. Mattress not included. Box spring not required. The storage unit has 2 fixed and 3 adjustable shelves to maximize your options. Shaker-inspired trim and metal handles on wall bed. Full bed when opened will require a clearance of 85.3" from the wall extending into the room. Clearance of 9.6" under the bed when it is open. Assembly required. Easy to install. Wall bed : 58.6" (W) x 18.2" (D) x 83.7" (H). 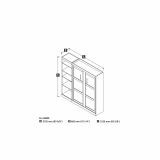 25'' storage unit : 25" (W) x 18.2" (D) x 83.7" (H).